Your search has returned 57 results. Save your search - find out immediately when "British poetry" is available at auction! Dufresnoy, Charles-Alphonse (1611-1668) trans. John Dryden (1631-1700) De Arte Graphica. The Art of Painting. Wilde, Gerald (1905-1986) Five Identical Signed Lithographs Illustrating T. S. Eliot's (1888-1965) Rhapsody on a Windy Night. Carroll, Lewis (1832-1898) Through the Looking-Glass, and What Alice Found There. Lord Alfred Tennyson's The Lady of Shalott and Andrew Lang's Johnny Nut and the Golden Goose . English Plays and Poetry, Sixteen Volumes. Decorative Bindings, Sets, Thirty-three Volumes. Decorative Bindings, Sets, English Poets, Seventy-five Volumes. Eliot, Thomas Stearns (1888-1965) Dante , Signed, Limited Edition. 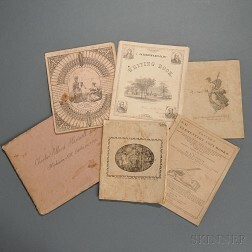 Copy Books, Six, 19th Century, British and American. 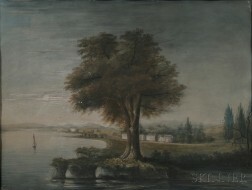 Attributed to George Beck (British/Baltimore/Philadelphia, 1748-1812) A South View of the City of Washington. Henry Treffry Dunn (British, 1838-1897) "Portrait of the Lady of Shalott"